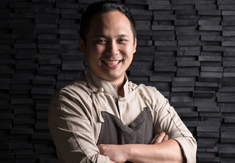 Chef Monthep who has had a lengthy background in western cuisine has decided to get back to the food he was born and raised with and joined TAAN in bringing “Hyper Local Innovative Thai Cuisine”. This journey of his began right after he returned from a trip to Hin Lad forest in Chaing Rai province, where he witnessed the way of life of the local Pga K'nyau tribe. From that moment on he was driven and inspired to take the greatest care of each ingredient he chooses and sources, this approach puts him firmly in line with international trends of honoring local and sustainable practices. “I would like every guest's dining experience at TAAN to be something new, different from any Thai food they have ever experienced before. A meal here is fundamentally based on how we interpret the food from each different region. We go far beyond the lines of the traditional correctness in arranging the food and balancing the taste, to create our own interpretations”. The best way to get an understanding of Chef Thep and TAAN's vision is with their nine-course set dinner. Additionally, as they are doing their best to minimise food wastage with the aim of being self-sustainable and environmentally-friendly, the dishes often change depending on the ingredients available on the day. This approach also ensures that diners are guaranteed a different dining experience each time they visit. Put the flame on high, add the 15g. lard into the bottom of iron cast wok pan till smoke begins. Add sliced pork neck into the highly heated pan evenly, let it caramelize then flip gently (at this stage the pork is not cooked yet). 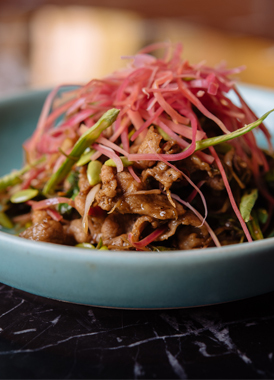 Leave the stir fried pork neck and set aside (pork will release their jus). Clean up the pan, place it on the stove on medium heat, add 15g. lard, garlic and chili. Stir fry till ii is fragrant, tone the heat down. Sprinkle sugar around the pan till is caramelized, then add sliced long beans, sliced lemongrass, acacia seed; wok fry them together. Add Budu paste (fermented fish sauce) to deglaze the sugar. Taste the sauce, if needed add some more fish sauce to kick up umami level and correct the saltiness. Increase the flame to high once again. When pan becomes hotter add the pork with their released jus, stir fry them equally. Finish with a handful of holy basil leaves then toss the pan several times. Add ginger torch flower, turn the heat off. Then toss them and make sure they have been mixed well together.